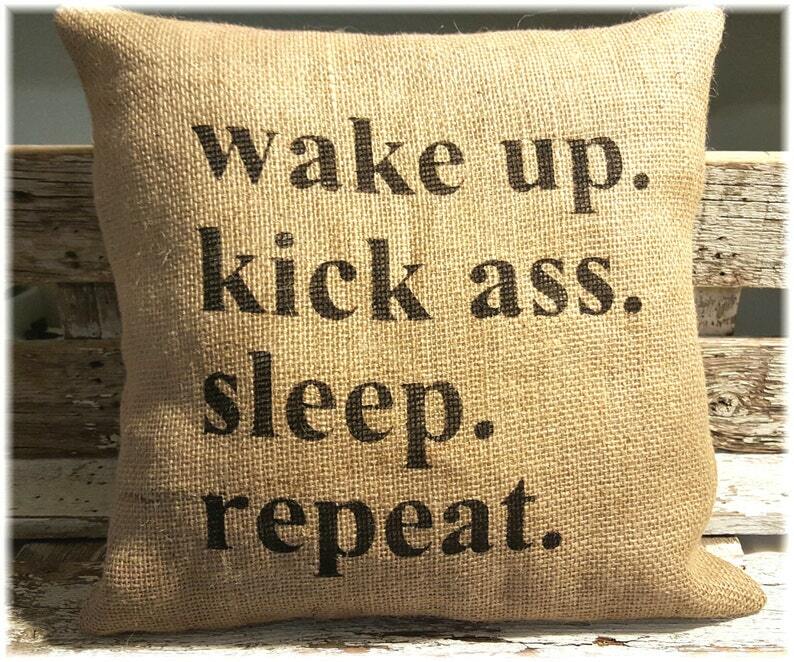 Burlap Pillow Wake Up Kick A** Sleep Repeat Burlap Stuffed Pillow is made with a high quality burlap and lined with cotton muslin. I have lined this pillow so that no white fiberfill shows through your pillow, this gives your pillow a very sturdy feel. How awesome is it for you to wake up to a good motivator every morning, your pillow will be there to remind you of how you want to spend your day, every day! Get going every morning with this beautiful burlap pillow. Wake Up Kick A** Sleep Repeat letters are painted black on the front of the pillow. Pillow measures approx 14" x 14"
All You Need Is Love Burlap Stuffed Pillow 14" x 14"
Happily Ever After Burlap Stuffed Pillow 14" x 14"
This Is My Happy Place Burlap Stuffed Pillow 14" x 14"
So simple and so very lovely! Thank you!! Always Kiss Me Goodnight Pillow, Burlap Stuffed Pillows, Throw Pillows, Decorative Pillows, Pillows With Sayings,Pillows Handmade 16" x 12"
i love us Pillow, Burlap Stuffed Pillows, Throw Pillows, Decorative Pillows, Pillows With Sayings, Valentine's Day Pillow 16" x 12"
Awesome Pillow, Burlap Stuffed Pillows, Throw Pillows, Decorative Pillows, Pillows With Sayings,Pillows Handmade Rectangle 16" x 12"